It was a Saturday, and Miranda had spent the day at work, leaving the recipe for Pakistani nihari (slow cooked lamb) in Ash’s capable hands. By the time she got home, he’d confused the butcher by requesting that a full leg of lamb was cut into five chunks, searched high and low in a number of different shops for black cardamon (eventually successfully), managed to grind the spices into a satisfactory powder and was just adding the spice blend to the pot. After letting it cook for a while, Miranda tasted the sauce. Now, Miranda is not one to shy away from spicy food, but even she was surprised at the extent to which her head felt like it was about to explode. There wasn’t that much chilli in it – surely? ‘Oh – I suppose the black pepper will be adding some heat, too,’ she realised. ‘I know! Three to four tablespoons is a lot,’ responded Ash. Miranda blinked in confusion. She’d read the recipe. She would have noticed an unusual quantity like that. Suddenly, a visual image of that part of the recipe floated into her mind: ‘3/4 tbsp’. Sure, we’d love an ice cream maker, a deep fat fryer, a fancy coffee machine… Truthfully, we’d like the entire Lakeland catalogue and an appropriately-sized kitchen to go with it. But if there was one kitchen gadget that would, above all others, make our culinary lives easier, it would be a dishwasher. Mechanical or human, we’re not fussy – as long as it didn’t have to be us. And that has possibly never been more evident than during the past week, when we’ve seemed to have an endless supply of dishes piling up next to the sink. It was Miranda’s 30th birthday on Thursday which meant that Ash made his yearly foray into the world of baking and produced a fabulous sticky toffee cake that we’re still making our way through. 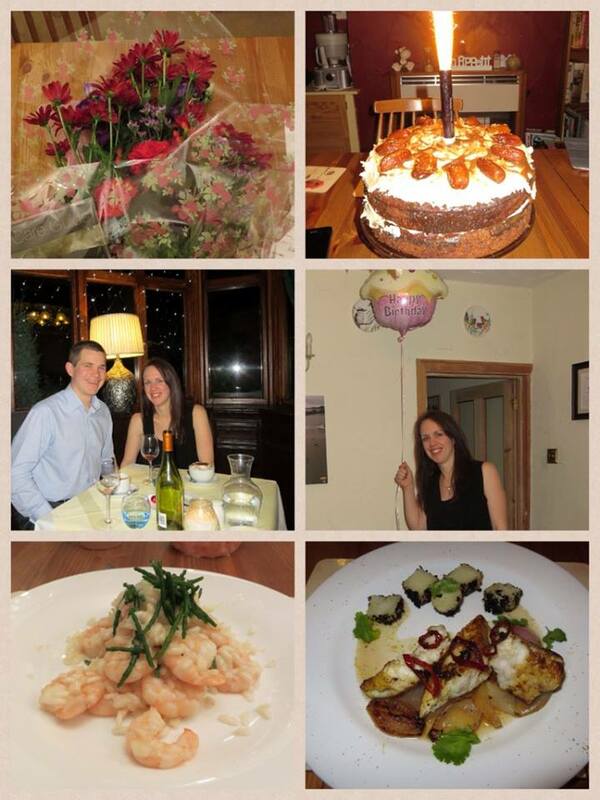 Then he cooked a lovely four-course meal as a birthday treat on Saturday night. This sort of frivolity doesn’t happen without utensils, though, so we were contending with a conglomerate of cake tins, mixing bowls, saucepans, frying pans, chopping boards, cutlery and crockery far bigger than either our sink or our draining board for days on end.